Instead of £87.00. You save £4.35 due to the online discount . 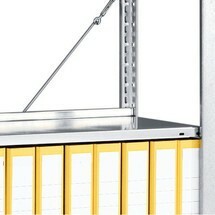 Long-term storage of important company documents requires sturdy shelving solutions. 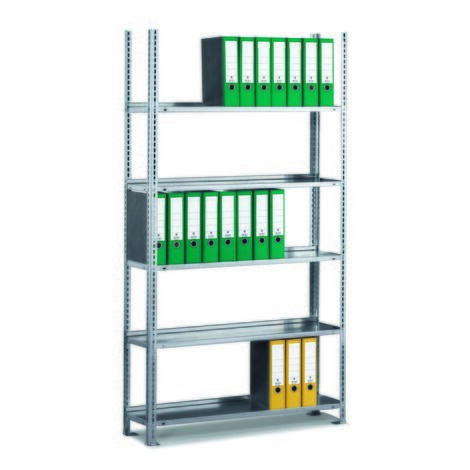 This galvanised META filing shelf base unit offers single-sided access to files and ring binders, making it an ideal shelving solution for large wall areas. All business processes have to be documented down to the very last detail. Yet conventional office spaces are unable to cope with the resulting quantity of files. Archives with a custom-fit shelving system represent the ideal solution to this problem. With its robust finish, the galvanised META bolt system offers tailored storage for A4 files and ring binders. 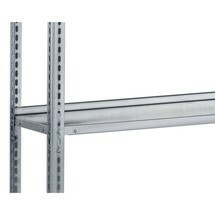 The shelves are made from high-quality steel plate with an M-shaped longitudinal channel and 5-point edge fold. This ensures an even distribution of the load. As a result, you can store heavy loads on these office shelves for long periods, safe in the knowledge that the file shape and material will remain perfectly intact. 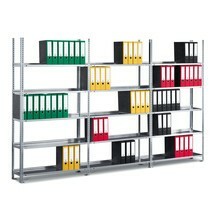 The office shelves of this META system are intended for single-sided access. 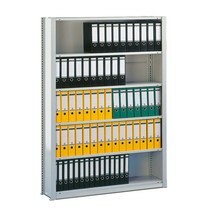 Robust back stops ensure that your files are held securely on the shelf. The upper level features no top shelf, meaning that you can use this area for larger formats. 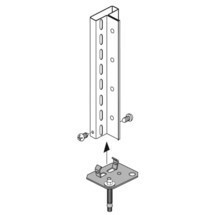 Assembly is a breeze thanks to the intelligent bolt system, which further enhances the robust construction. Bring order to your archive and purchase the practical, galvanised META filing shelf base unit, in single-sided design, from our shop. 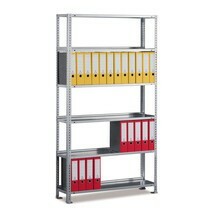 Top seller in Add-on units for file racks One-sided.